Acquiring gap-free and error-free solar radiation data for performance assessment can be quite challenging and expensive. Even more so if such data is to be systematically acquired for a large portfolio of PV systems across many regions. Regular updates of Solargis satellite-derived solar radiation is a reliable alternative or complementary solution. Solargis data improve efficiency and introduce transparency to performance reporting. Ground based measurements often have obvious or hidden errors. Use of satellite-derived irradiation data promotes transparency in performance reporting. Besides being independent, Solargis data have comparable accuracy to that of pyranometer measurements for monthly and yearly values. There are several satellite-derived solar data sources, and they have varying levels of accuracy. Independent validation studies that compare modeled data with high-quality ground observations show that Solargis has in most cases the lowest monthly RMSD and bias accuracy indicators for GHI. Therefore Solargis is the most suitable satellite-derived solar database for PV performance monitoring. 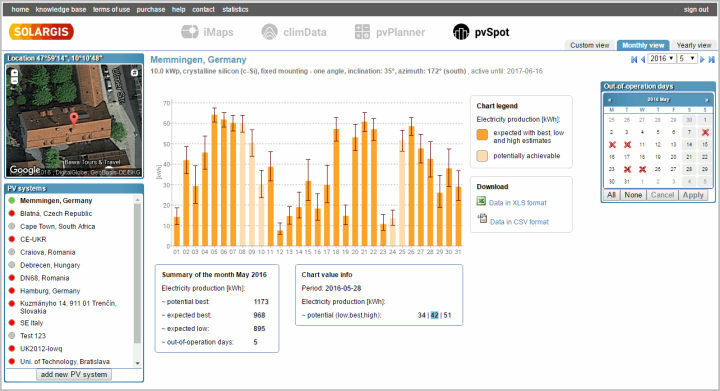 Besides using the pvSpot online application, Solargis provides also access to daily updated solar and expected PV production data via FTP or API service. 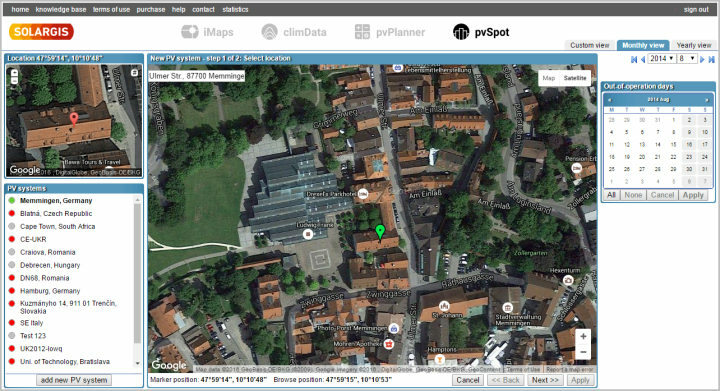 API service allows accessing Solargis directly from other monitoring platform. 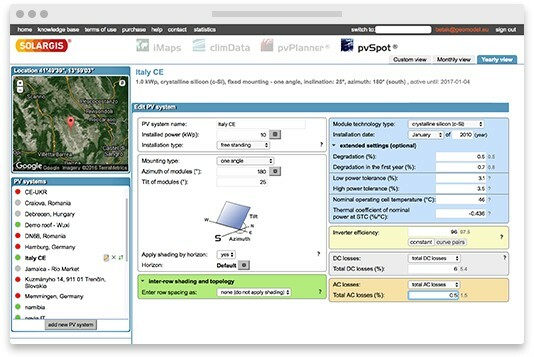 Solargis pvSpot service not only provides access to solar radiation and air temperature but also simulates PV power production. Thus you can directly compare actual PV power production with expected production for any period of interest. 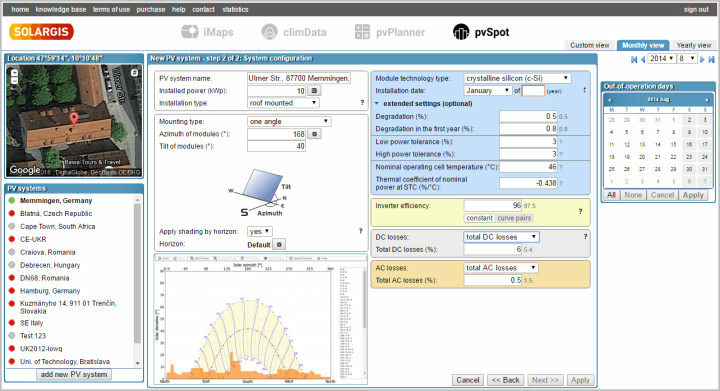 Set up basic and advanced properties of your PV system, including mounting, local horizon, or specific losses. Compare calculated potential of PV electricity production with the real production from the electrometer. Comparison is available for daily, monthly or custom defined period.